Horizontally-opposed engines are often referred to as “boxer” engines because the motion of the pistons sort of resembles a boxer, punching. Really, though, if any engine should be named for a boxer, it’s the other kind of opposed engine: the kind where the pistons actually “punch” right at each other. 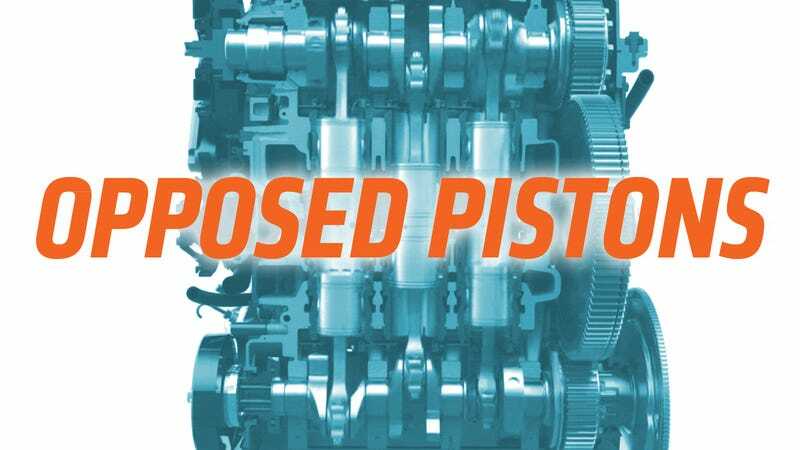 They’re called opposed-piston engines, and they’re fascinating. Opposed-piston engines are not new at all; they’ve been around since the late 1800s, and even earlier in steam form. In fact, the famous Civil War ironclad USS Monitor used a variant of an opposed-piston engine known as a “vibrating lever” engine. Essentially, an opposed-piston internal combustion engine is a two-stroke engine with no cylinder head, two separate crankshafts, onto which two sets of pistons are connected, with the pistons sharing one cylinder. The pistons meet (well, nearly meet) at the center of the cylinder, the top dead center (TDC) for both pistons. 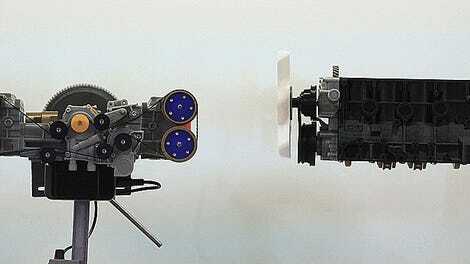 ports on the sides of the cylinder let fuel/air in and exhaust out, and are exposed by the motion of the piston. Because these engines are two-stroke, there’s a power stroke every time the pistons meet. These have been rarely used in the automotive industry, likely because, since they’re inherently two-stroke designs, they tend to be more suited for the low-end cars that tended to be the domain of two-stroke engines. The expense and complexity of the two-crank design of an opposed-piston engine must have made these engines more complex and expensive to build than small two-stroke engines, even accounting for cylinder heads in engines like the famous DKW two-stroke three-cylinder. That would have made opposed-piston engines too expensive for cheap cars and still not preferable for higher-end vehicles, by the nature of being a smoky two-stroke. What’s especially notable about the engines is that, in three-cylinder (remember, six-piston) form, the Achates Power vertically-oriented opposed-piston diesel engine shown in the video there managed to obtain thermal efficiencies in the high 40s/low 50s percent. Keep in mind that a conventional four-stroke diesel engine will only be about 35 percent thermally efficient, on average. That’s a big bump. They’re very interesting engines, and I could watch animations of how they work all day. Plus, if these do become an option for full-size pickup trucks, I can’t wait to watch the PR people scramble to find a way to explain why a three-cylinder engine is somehow better to the V-8 obsessed average truck buyer.